There are two types of music fans: people who love Garland Jeffreys and people who've never heard of him. His latest album is proof that the legendary artist still has a lot of great music left. By any artistic standard, Garland Jeffreys ought to be a household name. His intoxicating brand of love songs, social protest, and life reflections filtered through rock, soul, and even more exotic musical hybrids have earned him buckets of critical accolades and a dedicated fan base. Sadly, though, he's still not received the commercial rewards afforded to many of his contemporaries. Still, he keeps cranking out top-notch albums well into his 70s, and his latest offering is more proof that he deserves musical comparisons that fall somewhere between Van Morrison, Bruce Springsteen, and Graham Parker (he's even worked with band members of the latter two in the past). On 14 Steps to Harlem, Jeffreys makes something of an autobiographical statement, sharing tales of childhood as well as present-day preoccupations in a collection of songs that can only be interpreted in the first person. For instance, the title track is a loving tribute to Jeffreys’ father, whose lengthy commute from Sheepshead Bay, Brooklyn to Harlem was a testament to his work ethic and dedication to his family. “Do it every day," Jeffreys emotes in his soulful shout, still sounding polished and graceful after nearly 50 years of recording and touring. Those childhood memories also rear their head on the manic, infectious blues boogie of “Schoolyard Blues”, where Jeffreys recounts his early days as a vertically challenged basketball hustler: “Standing in the asphalt jungle / What’s a five-foot-six boy tryin’ to do? / When you’re looking up from the ground / And a six-foot-nine boy’s looking right down on you." But life is also about looking forward and living in the present, and “Venus” is about as good as it gets when it comes to a simple, soulful mid-tempo love song dedicated to the joys of married life. Hammond organs, sharp guitar leads, and raucous backup vocals give the song a meat-and-potatoes E-Street Band feel. “Spanish Heart” is another tender tribute to a relationship that transcends all manner of struggle and strife: “The lines of blood are drawn when it comes to you and me / Way beyond the shades of careless bigotry / I’m your man-o-war, your dedicated troubadour / And you’re the one that I have waited for." It’s that kind of impeccable eloquence that invites comparisons to wordsmiths like Elvis Costello. And it certainly doesn’t hurt that those words spill out alongside a chugging, irresistible Latin beat. Family life also finds its way into the arrangements on 14 Steps to Harlem, as the tender ballad “Time Goes Away” features a duet between Jeffreys and his adult daughter, Savannah. Jeffreys’ younger days recording and touring in New York City are lovingly chronicled in “Reggae on Broadway”, a song chock full of memories of meeting Joe Strummer and the rest of the Clash in New York City. The song has the benefit of not only recounting those crucial earlier days with great lucidity, but also infusing the album with an authentic reggae arrangement (paying tribute to both Jeffreys’ and the Clash’s well-documented love of the genre). The album’s opening track, the synth-poppy “When You Call My Name”, is another nod to a musical genre Jeffreys has dipped into on more than one occasion -- the driving 4/4 beat and sequenced retro keyboards recall an early ‘80s new wave aesthetic that Jeffreys toyed with on his acclaimed 1981 album, Escape Artist. It’s a strong acknowledgment of past musical journeys that never sounds contrived or parodying. As a child of black, white, and Puerto Rican heritage, Jeffreys is no stranger to addressing issues of race (it was the focal point of 1992's Don’t Call Me Buckwheat), and “Colored Boy Said” is proof that the subject is still very much on his mind. “I got a president who looks like me”, goes the song’s insistent refrain over a funky hip-hop beat. Sure, that line immediately became obsolete for Jeffreys on Inauguration Day 2017, but the topics are still vital. He sings, “Put down in your grave / Never forget that day / When they choked his breath away / Colored boy say.” On the ethereal soul ballad “I’m a Dreamer”, Jeffreys looks back at the diverse nature of his childhood days with great fondness: “When I was growing up in Brooklyn town / All my friends were black, white and brown / Still had my fun / Each and everyone / Brothers all around / In a little small town." 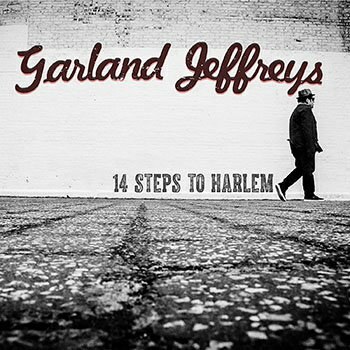 While Jeffreys still excels as a songwriter in 2017, the pair of cover songs on 14 Steps to Harlem meshes well with the originals. He transforms the Beatles’ “Help” into a heartfelt gospel ballad, adding classy touches like pedal steel guitar and a plaintive melodica. Jeffreys also pays tribute to his late pal (and former Syracuse University classmate), Lou Reed, with a rousing cover of the Velvet Underground’s “I’m Waiting For the Man” that forgoes the indie drone of the original with a more traditional bluesy, barroom feel that subtracts none of the song’s potency. Speaking of Reed: his widow, musical polymath (and close Jeffreys friend) Laurie Anderson, contributes electric violin to the elegant "Luna Park Love Theme." 14 Steps to Harlem is a powerful album steeped with the maturity and experience of a man of Garland Jeffreys’ years, but it’s by no means the cranky mutterings of an old curmudgeon. This is the music of a man who can spin a good yarn about the old days but has no problem keeping up with rock stars more than half his age.